View of the Kazakh Uplands which is a tectonically uplifted planation surface. The background areas are particularly flat. 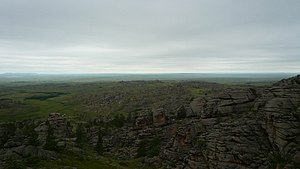 The Kazakh Uplands are usually referred as a peneplain. In geology and geomorphology a planation surface is a large-scale surface that is almost flat with the possible exception of some residuals hills. The processes that form planation surfaces are labelled collectively planation and are exogenic (chiefly erosion). Planation surfaces are planated regardless of bedrock structures. On Earth they constitute some of the most common landscapes. Peneplains and pediplains are types of planation surfaces planated respectively by "peneplanation" and "pediplanation". In addition to these there are planation surfaces proposed to be formed by cryoplanation, marine processes, areal glacial erosion and salt weathering. The term planation surface is often preferred over others because some more specific planation surface types and processes remain controversial. Etchplains are weathered planation surfaces. Large planation surfaces, like the African Surface, are typically formed diachronously. Planation surfaces are often thought to form at distinct base levels with sequences of them representing uplift events. However the disposition of some so-called planation surfaces may better reflect the easiness of erosion into different lithologies or structures and may therefore not fit any uplift scheme. ^ a b Migoń, Piotr (2004). "Planation surface". In Goudie, A.S. (ed.). Encyclopedia of Geomorphology. pp. 788–792. ^ a b "planation surface". Encyclopædia Britannica. ^ Migoń, Piotr (2004). "Etchning, etchplain and etchplanation". In Goudie, A.S. (ed.). Encyclopedia of Geomorphology. pp. 345–347. ^ Burke, Kevin; Gunnell, Yanni (2008). The African Erosion Surface: A Continental-Scale Synthesis of Geomorphology, Tectonics, and Environmental Change over the Past 180 Million Years. The Geological Society of America. pp. 6–7. ISBN 978-0-8137-1201-7. ^ a b Römer, Wolfgang (2010). "Multiple planation surfaces in basement regions: Implications for the reconstruction of periods of denudation and uplift in southern Zimbabwe". Geomorphology. 114: 199–212. This page was last edited on 20 December 2018, at 04:52 (UTC).